Anterolisthesis describes the traditional forward movement of vertebral slippage conditions. 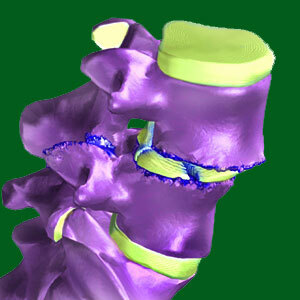 Most spondylolisthesis-affected vertebrae migrate anteriorly, unless otherwise specified. The diametric opposite diagnosis, retrolisthesis, is rarer and affects a smaller percentage of the overall listhesis patient population, usually for highly specific reasons. When doctors discuss or diagnose spondylolisthesis, it is always assumed that the condition follows an anterolisthesis pattern, unless stated otherwise. The natural lordotic curvatures of the spine in the neck and lower back dispose migrating vertebra to move anteriorly in virtually every case. When this pattern is broken, there is usually an obvious explanation related to case-specific circumstances in spinal structure or specific type of injurious causation. This treatise examines the diagnosis of anterior spondylolisthesis and provides a complete overview of the condition from an anatomical point of view. Anterolisthesis and spondylolisthesis are identical terminologies for most practical applications. This is because most cases of spondylolisthesis are of the anterior variety and retrolisthesis is almost always diagnosed specifically as such or the similar term retrospondylolisthesis. Anterior listhesis conditions involve an atypical forward movement of the affected vertebral bone towards the front of the body. In essence, while vertebrae are not in perfectly straight alignment in a typical spine due to the existence of lordotic and kyphotic curvatures in the sagittal plane, listhesis conditions involve excessive and abnormal degrees of forward movement when compared to the vertebral above and below. Since listhesis generally occurs in the lumbar spine, and less frequently occurs in the neck, and since both of these regions demonstrate lordotic curvatures, the actual anatomical design of these regions disposes listhesis profiles towards anterior movement. This is in stark contrast to the rarest cases of thoracic listhesis which might take on a retrolisthesis profile due to the kyphotic curvature of this upper/middle back region. We have discovered that many cases of retrolisthesis are actually misdiagnosed and reactionary adjustments to primary anterior spondylolisthesis. Basically this means that there is a primary vertebral migration towards the front of the body, while a neighboring vertebral bone is slightly posterior to its normal position as the spine tries to maintain stability given the presence of the primary anterior spondylolisthesis issue. These conditions should not be considered true retrolisthesis, since they are merely consequences of a primary listhesis condition and are usually the results of functional and not purely structural causation. Given this fact, true retrolisthesis is even rarer than it first appears to be. However, there are patient profiles where both antero and retro versions of spondylolisthesis truly do exist in the same patient and even in adjacent vertebral bones. It should be noted that since spondylolisthesis can change the typical curvature patterns in both the sagittal and coronal plane, vertebrae may appear to be antero or retro to a normal placement location, but are really just slightly out of their ideal anatomical places due to changes in these curvatures. Obviously, this does not apply when retrolisthesis exists alone without primary anterior listhesis. Anterior listhesis conditions represent the average case profile and are therefore rarely symptom generating. The vast majority of diagnosed patients will demonstrate mild (grade 1) or moderate (usually low grade 2) listhesis in an anterior direction at L5, although L4 is also relatively commonly affected. Less typically, patients might demonstrate similar anterospondylolisthesis conditions in the neck, usually affecting C5, C5, C7 or T1. The least common anterior listhesis issues affect other vertebral locations and are usually the results of highly specific injury or other unusual circumstantial causation.